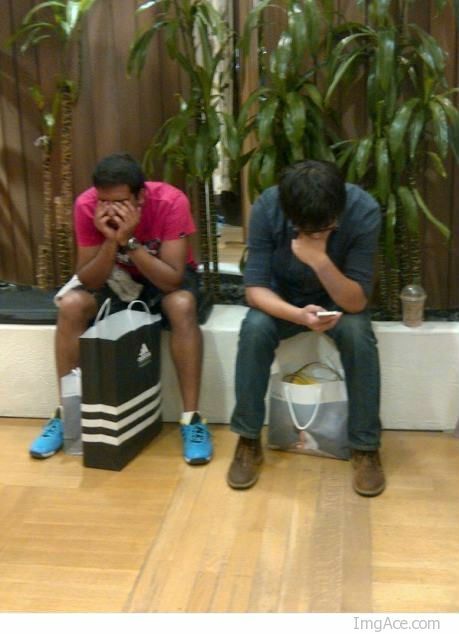 All normal ladies out there have been in the presence of the above emotion before, the burning hatred that your boyfriend feels when they come shopping with you (nerd guy or not). But the stores you shop at are smart and have figured out a way to quell their desire to gouge their own eyes out for a short amount of time so you can continue trying on cute outfits. These stores have seating areas! This was my 3rd year attending Comic-Con and I came to a very stark realization while I was shuffling around the Expo floor with my feet and legs killing me waiting for Cyclops to finalize his purchases at the Chessex booth…Comic-Con needs a sitting area for wayward girlfriends. There is literally no good place to exist while your boyfriend is shopping, if you stand at the booth with them you are in the way of someone who actually cares about purchasing dice and if you try and stand away from the booth you are constantly getting hit by people trying to navigate the floor. As I was explaining this problem and what I thought was a brilliant idea to Spike and Ashley, she suggested something that was about 1000x better than my truly inspired idea. Comic-Con should take one of the rooms at the San Diego Convention Center, like 5ABCDFG and turn it into a Mani-Pedi lounge!!! I seriously can’t believe that no one has thought of this before. Instead of grumpy, irritable girlfriends crowding up the Con floor you have happy girlfriends getting a foot massage. Happy girlfriends = happy nerds and happy nerds = more purchasing power on the floor. EVERYONE WINS! So Comic-Con please partner with someone like OPI, create a “Comic-Con Exclusive” (everyone loves those) nail polish and make this happen for all the normal girls (guys?) that attend your show, who’s with me? !